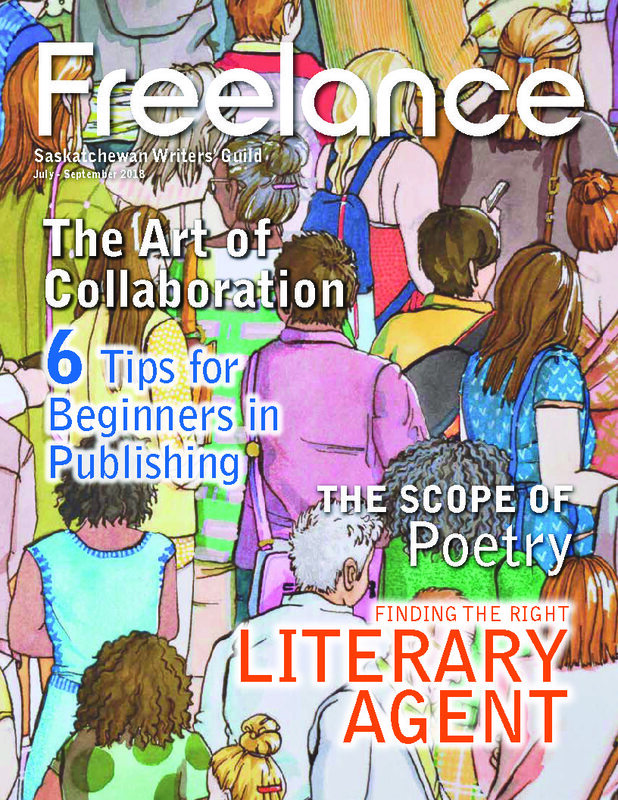 Cover of the July-September 2018 issue of Freelance. When I talk about writing (which I do, rather a lot), I’ll often say something like, “the most important part of writing is rewriting.” And I believe that’s true…but what rewriting means to an individual author varies. I’ve recently started a podcast, The Worldshapers, in which I chat with science fiction and fantasy authors about their creative process. One of my questions is always about revision: what do they do when they get to the end of the first draft? My first three guests on the podcast were Robert J. Sawyer, Canada’s best-known (and bestselling) science fiction author; Tanya Huff, a Canadian fantasy author with more than 1.2 million copies of her novels in print; and John Scalzi, a New York Timesbestselling science-fiction author who three years ago signed a $3.4 million deal for thirteen books, and whose first novel, Old Man’s War, and most recent, The Collapsing Empire, are also in development as television series. Sawyer says he’s a huge believer in rewriting, which isn’t surprising, considering he calls his first draft (in a phrase he believes came from Canadian horror writer Edo van Belkom), “the vomit pass,” because, “it’s an unpleasant process getting it out, but you actually do feel better.” For him, the important thing is to get ideas on paper, because they’re evanescent, liable to vanish if not pinned down. Once he has that first draft, he does more—many more, maybe four or five. What he doesn’t do is a lot of rewriting after the book goes to his editor. In fact, he says, his goal is to receive only one word of response from the editor: “Great.” And, he adds, most of his books have indeed been published with no editorial changes whatsoever. Tanya Huff, on the other hand, says her first draft is probably about eighty to eighty-five percent of what is actually published, then she “layers it up from there.” She likes to say that there are two kinds of writers, those who build houses, and those who build walls. Contractors, when building houses, build a foundation, then a frame, and then add layers of complexity until the house is complete. Someone building a wall, however, has to build it right the first time: if she misses a brick at the bottom, the whole thing collapses. Sheila Gilbert, Huff’s editor (and mine) at DAW Books typically gets Huff to add more detail. She thinks this may relate to the fact her only formal writing training was in television, where details are put in “by the other seventy-five people who work on the property” after the initial scriptwriter. Huff has now written thirty-two books for DAW, all of them edited by Sheila, and says at this point she can hear Sheila’s voice in her head as she writes. My personal rewriting style is very close to Huff’s. Like her, my first draft is usually within eighty to eight-five percent what’s published, and then I complexify–and, like her, I’m usually asked by Sheila to add more detail yet. Asked if he rewrites, John Scalzi’s first response was a flat, “No.” But that’s not quite true. He does what he calls “rolling” or “fractal” rewrites-—in other words, he rewrites as he goes, so that when he gets to the end, there’s no need to rewrite the whole thing from the beginning. Scalzi thinks there are two reasons he works this way. One, he’s a former journalist, and in journalism, “you have write a couple of thousand words every few days and it’s all due at 3 p.m. and you have to write clean copy,” experience he thinks helps him organize his thoughts as he writes. But, two, he thinks the revision process is dictated by the instruments people use. As it happens, Sawyer, Huff, and I are all pretty much the same age. We wrote longhand as kids, moved to typewriters, and then finally to computers. Writing longhand or on a typewriter, you pretty much have to work in drafts: you finish it, mark it up, then write or type it again. So, yes, rewriting is an important part of writing—but how you do it, or even at what point you do it in the process, is very much an individual choice. As is all of writing—something to remember whenever anyone (even me!) gives you what sounds like a hard and fast rule about how to go about crafting your stories.